If you love the beach as much as we do, you’ll want to stay for more than a day trip! And what better way to do that than by beach camping? Queensland is literally spoilt for choice when it comes to camping on the beach, or near the beach, meaning you may not even need 4wd! If beach camping sounds like your cup of tea and you’re looking for ideas for your next family holiday, then check out our favourite places for awesome beach camping in Queensland! We have everything from no-amenities beach camps for those wanting to get off the beaten track and really be at one with nature, to all-singing all-dancing holiday parks for those who prefer their beach holiday with a side of home comfort and extra entertainment. And of course, everything in between! Whatever you’re looking for, we have the best beach camping holiday ideas for you! 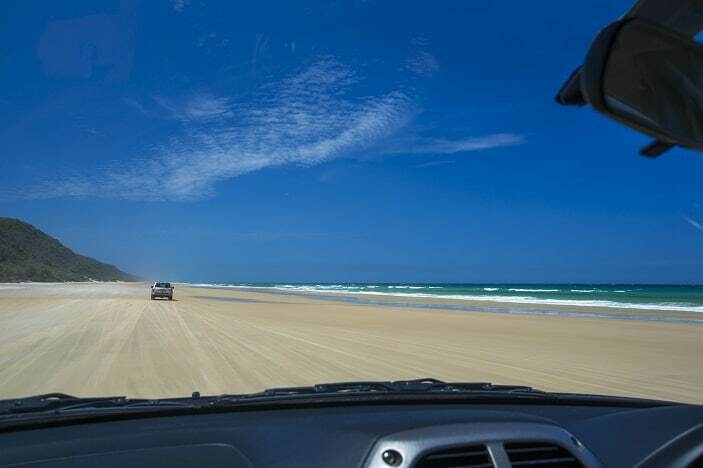 Fraser Island is a stunning natural wonder off the Queensland coast and a must-visit for families. With over 45 camping areas to choose from, you will never be short of awesome beach camping options. For families who are new to Fraser, we recommend camping within areas with dingo deterrent fences. There’s the Dundubara camping area, set behind the dunes in coastal forest. There’s Waddy Point camping area on the north-east coast 5km from Indian Head, plus Cornwells organised group camping area set behind foredunes close to the beach for a group and school bookings. 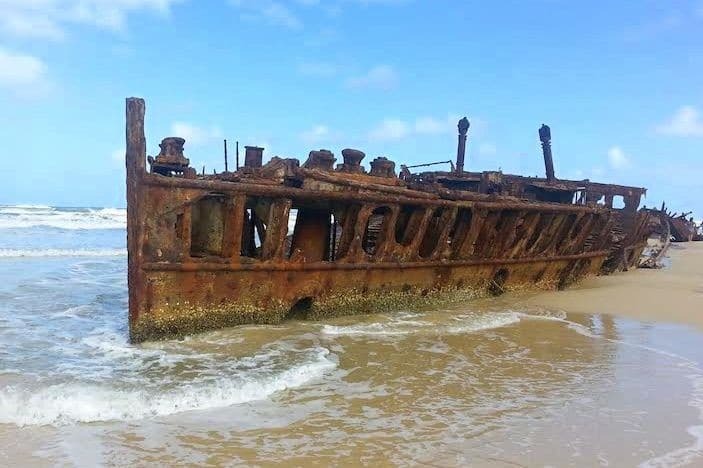 See parks.des.qld.gov.au for more information, and check out our guide to Fraser Island with Kids. 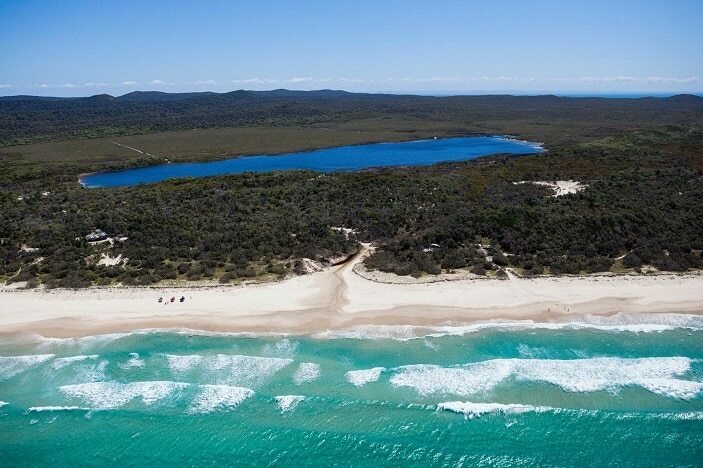 Inskip Point offers stunning coastline and off-the-beaten-track beach camping with limited facilities. This is the place to go when you want to get away from it all! There are five camping areas to choose from here — SS Dorrigo and MV Sarawak are suitable for 2WD vehicles and caravan/campers, while Natone, MV Beagle and The Oaks camping areas are best suited to 4WD vehicles. Take all your supplies, bring the family dog (on a leash), and you’re in for a lovely getaway from everything! You can find out more about the facilities and activities here. 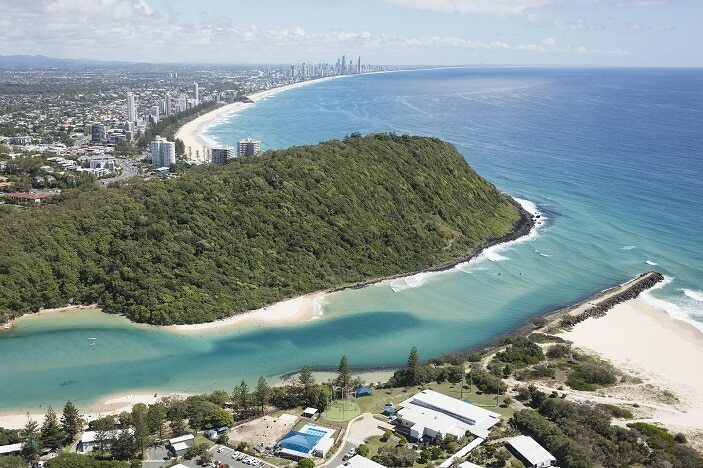 Not far from Brisbane, the Mooloolaba Beach Holiday Park offers beachfront camping mixed with convenience. There are 24 sites with beach and rockpool frontages. You can swim, surf and bodyboard right on your doorstep. You can also enjoy all the shops, restaurants and cafes off the Esplanade, just a short walk away. If you think this park is the right place for your next family holiday, you can read all about it here. This is one of the closest places to Brisbane where you can enjoy true beach camping, away from the crowds, with just the sand and surf and a few koalas in the trees for company. There are six beaches to choose from, the prices are really low, and the setting is stunning. These camping areas are the sort of places you’ll love so much you won’t want to tell anyone else about! 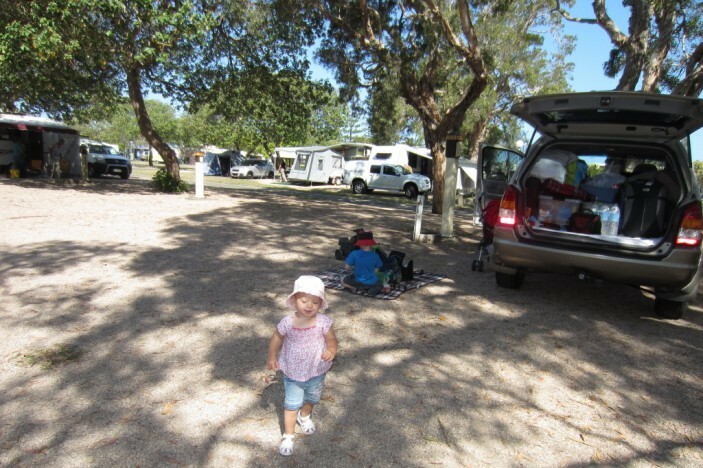 You can find out all about the camping at minjerribahcamping.com.au, and before you go read our guide to North Stradbroke Island for Kids. 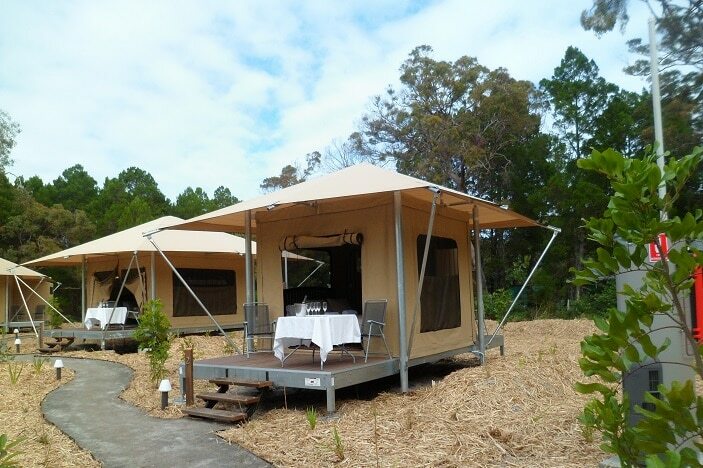 North-West Camping Zone offers an idyllic retreat for families on beautiful Moreton Island. You can set up camp under the shade of some trees, right on the edge of the beach. This is self-sufficient camping without any provided facilities. It’s on a beautiful beach, with calm waters which is great for families. You can enjoy walking tracks, sand dune boarding, 4WDriving, or snorkelling the wrecks and hand-feeding wild dolphins at Tangalooma. You can find out more here. This quiet holiday park is located right on the sandy shores of the creek and just along the footpath from the surf beach. There is a main pool and toddler pool with water play, a playground, tennis court, boat ramp, a range of bikes for hire and all amenities. You can find out more about this great beach camping park here. 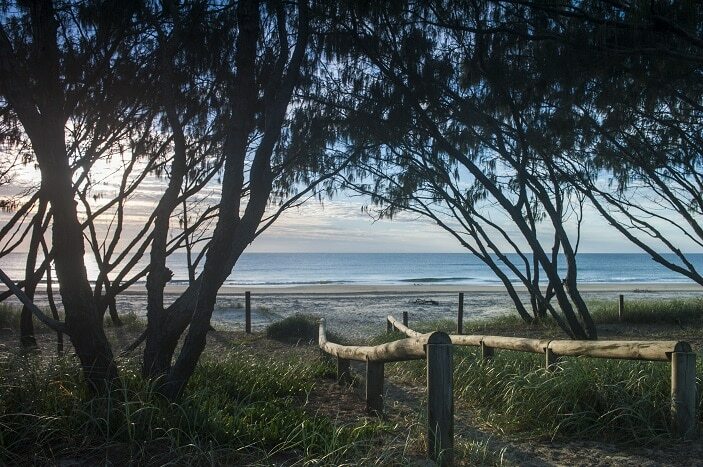 This beautiful beach camping area is located just north of Noosa. The camping area is accessed by a 4WD beach drive. There are no facilities, so just pack everything you need, hit the road and get out into nature! Don’t worry, there are ice trucks with ice, newspapers and refreshments if you want some home comforts. Aside from that, just enjoy the beach directly outside your tent, try dune tobogganing, swimming, surfing, fishing, 4WDriving, and all the fun of the beach! Read our full review of Teewah Beach Camping Area here. 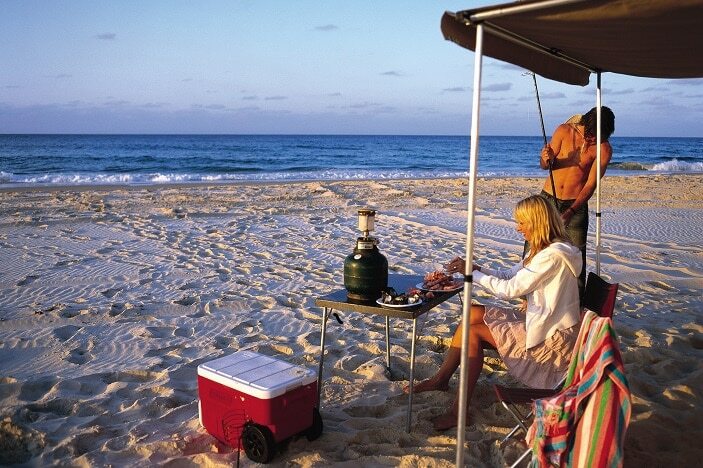 There are 4 camping spots on Bribie Island, with Ocean Beach offering the on-beach experience. 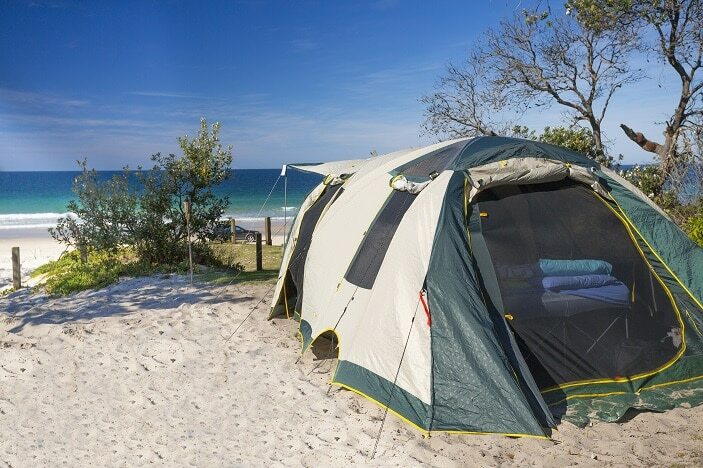 You need a 4WD and a permit to camp on Bribie Island. Campfires are permitted within fire rings (unless there is a fire ban). Located right on the edge of the surf beach at Agnes Water, this is the perfect spot for a family holiday. There’s everything from powered and unpowered tent and van sites to beautiful apartments and glamping safari tents overlooking the ocean. There are surf lessons on the beach, or just hire a board and have a go. It’s the perfect place to chill out and enjoy everything the beach has to offer. The on-site cafe is really lovely too! You can find out more here. 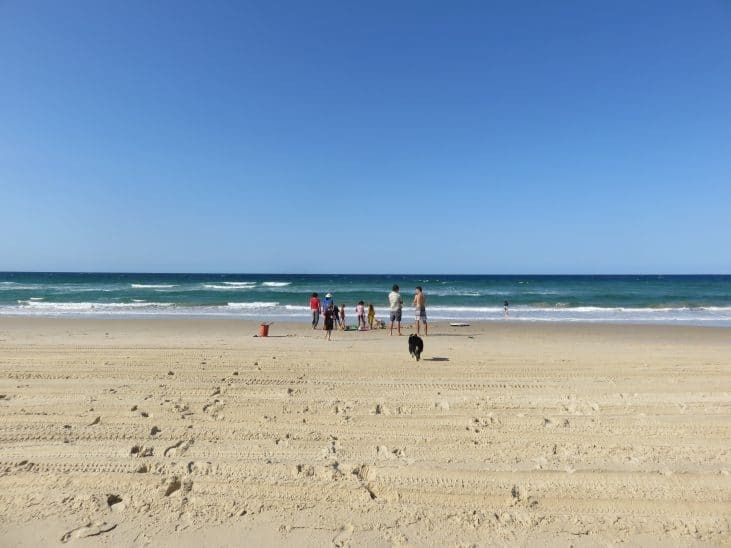 This holiday park is located right at the mouth of the Maroochy River, with lovely sandy shores along the river edge and the beachfront just a very short stroll away. There’s also a park and Aquatic Centre just 400m away, and plenty of local options for dining. This is beach camping with everything on your doorstep! You can read our review of Cotton Tree Holiday Park here. If you’re fancying a beach holiday south of Brisbane, then you’ll find it hard to look past Pottsville South Holiday Park. The beach here is on the estuary, so the water is calm and shallow, perfect for families! There are great amenities, as well as facilities like basketball courts and beach volleyball. Bring your scooters, bikes, kayaks and fishing gear to make the most of this great holiday park. Plus there are shops just a five-minute walk away. Check out our full review of Pottsville South Holiday Park here. After a long day of building sandcastles, jumping waves and searching in rock pools, you can take a sunset stroll along the seafront, cook dinner over a campfire, and fall asleep to the sound of waves lapping the shore. For a wealth of resources on family-friendly camping, click here. 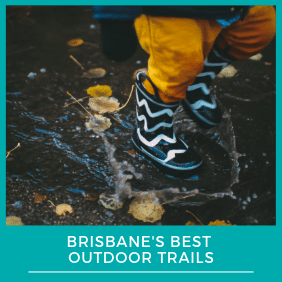 Plus check out the Best Places to Go Camping with Kids and Your Favourite Camping Spots.